If you’re a beginner and thinking about what guitar pedals to buy, you will have noticed that there’s a massive number of choices available. 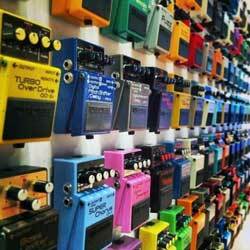 Guitar pedals can sometimes fill up rooms of guitar shops. The number of guitar pedals available is overwhelming. 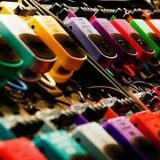 I experienced this first hand in a massive guitar shop in Tokyo – an entire wall filled with shelves were taken up by every guitar pedal I’ve ever heard about. So the good and bad news is that you have a lot of choices when it comes to guitar pedals! In this guide, I will go through my recommendations on a beginner guitar pedal setup that gives you a range of different effects while staying simple. Think of this as the starting point to building your own unique guitar rig. 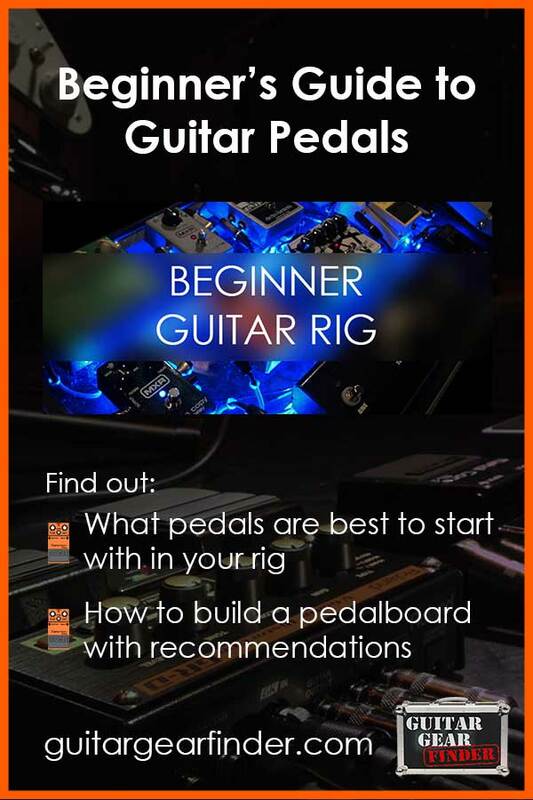 The idea is that with the pedals I cover in this guide, you will have a good foundation for your pedal board. Then as you grow as a guitarist you can decide what extra pedals you want to add in or which pedals you want to swap around. This guide will focus on using stompboxes. If you like the idea of picking individual pedals for certain effects and customizing your pedalboard exactly the way you like it, this guide will help you do that. The alternative is to use a multi-effects pedal such as the Zoom G5 or the Line 6 POD HD500X. With a multi-effects pedal you have instant access to a massive range of effects. So while a multi-effects pedal is worth considering, this guide will focus on stompboxes. If you want to learn about guitar effects, how each type works and how to use them, check out this Guitar Effects Course. It will give you examples of each type of effect in action as well as how to use them properly. In this guide, we’ll go through the absolute basics on different types of effects. If you want to learn more and hear examples, check out the course. Let’s have a quick look at each category so you can decide whether you want to have a pedal from that category or not. Most guitarists will have a tuner pedal in their rig. When you consider that you can easily get an app on your smartphone for a tuner, it might not seem that important to have a tuner pedal. There are two main reasons for having a tuner pedal. First, it’s convenient to simply hit the footswitch and be able to tune your guitar. If you’re at band practice or at a gig, you definitely don’t want to be messing around with an app or a separate tuner. The second reason is that it’s a quick and easy way to mute your guitar. When a tuner pedal is activated it mutes your signal. This is useful when playing live and makes you look far more professional. The audience shouldn’t have to hear you tune your guitar. Guitarists from a wide range of genres have fallen in love with the wah ever since Jimi Hendrix popularized it back in the 60s. If you play rock, blues, metal, funk or similar styles, you have probably heard quite a few solos using the wah. It’s a versatile effect that gives you a lot of control over your tone. It’s one of the most expressive effects you can use which is why it’s so common on pedalboards. If you have never used a wah before, I highly recommend it. I created a lesson on how to use the Wah pedal so if you have never used one before, use the lesson to get started. Dynamics pedals aren’t effect pedals in the normal sense. Think of dynamics pedals as a way to control your sound. Compression pedals basically even out your volume so soft and loud parts are a bit more consistent. Some guitarists love them and others hate them. If you get to the point where you have a lot of different effects in your rig, you might want to consider a compressor as a way to improve your overall tone. I won’t include dynamics pedals in the basic rig as beginners will get very little benefit out of them. Later on as you improve as a guitarist, you might want to look into one. A distortion or overdrive pedal is one of the first effects pedals guitarists tend to buy. While you can definitely use your amp instead of a pedal, a significant number of guitarists prefer using a pedal for their high gain tones. Your decision to get a distortion or overdrive pedal should look at the type of amp you use and whether you like the high gain options it gives you. The other way to think about it is that you’re likely to move through different amps over time so having the same distortion or overdrive pedal will make sure you get to keep the drive sounds you like. Distortion and overdrive are two different types of gain effects. I’ll be writing a guide on comparing the two options as it’s too much to cover here. Pitch shifters such as DigiTech’s Whammy takes your guitar signal and raises or lowers the pitch (or a combination). Tom Morello uses it to come up with some creative solos and riffs while other guitarists use it to play harmonies. There are many different pitch shifting pedals out there that achieve different results. For a beginner, a pitch-shifting pedal isn’t too important unless the bands and guitarists you listen to use one. So unless you’re a Rage Against the Machine or Audioslave fan or you know a lot of songs that use pitch effects, I recommend skipping a pitch pedal for now. Modulation covers a few different types of effects such as chorus, flanger, phaser, tremolo, Uni-vibe, Vibrato, and a lot of wacky sounding effects such as ring modulators. When a lot of people think of ‘guitar effects’, they’re often imagining some sort of modulation effect. Modulation is great to come up with creative riffs or ideas and Jimi Hendrix was well known to experiment with modulation pedals. You can even use modulation in more subtle ways. For example, a bit of chorus can add a lot of life to your clean tone. It can take a dry and lifeless tone into something a bit more warm and full. Some guitarists love the way modulation pedals can add color to your tone while others prefer an uncolored tone. Delay and reverb are lumped together here because they both change what happens after you play something. A delay pedal will repeat what you play based on its settings while a reverb pedal will create a sound trail to simulate what you hear when you play in an open room or large hall. I highly recommend every beginner buy a versatile delay pedal because they’re so commonly used in essentially every music style you can think of. Almost every guitarist has at least one delay pedal in their rig. Some guitarists have multiple delay pedals so they can access a range of different delay effects or combine them as they want. Delay is such an important effect because it’s so versatile. You can use it with essentially any guitar tone with great results. There are countless guitar tuner pedals available today and for years the most popular option was a BOSS TU-2. Many guitarists who used the BOSS TU-2 have upgraded to the TU-3 but that’s not the pedal I recommend. The tuner pedal I recommend is the PolyTune 2 Mini by TC Electronic. 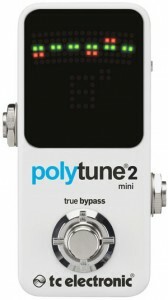 There are other reasons why the PolyTune 2 Mini is such a great tuner pedal and I cover them in my review here. Even if you have a tuner built into your amp or you have a physical tuner, I highly recommend getting a stompbox tuner. There are a quite a few different wah pedals available today from fully customizable wahs down to the simplest imaginable. There are also plenty of signature wahs out there from well-known wah players. The goal of this guide is to give you a list of pedals that you’re not going to grow out of. For that reason, I’m not going to suggest any signature wahs because your tastes may change over time. The wah I’m recommending here has stood the test of time and is favored by a significant number of guitarists: the Dunlop Original Crybaby. 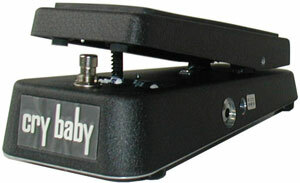 The Original Crybaby gives you the classic wah sound in a simple package. You won’t need to worry about tweaking different knobs – you simply plug it in and you’re good to go. You can find out more on the Original Crybaby in my review here as well as alternatives if you feel you need something with more features and flexibility. Distortion and overdrive are very personal effects for guitarists. 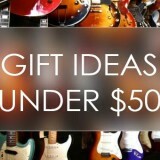 Every guitarist will want something different. Having control over the type of distortion or overdrive you use is important as a beginner. As you develop as a guitarist, your preferences for distortion or overdrive will change. If you play a wide range of music styles you may also need to quickly jump between completely different drive sounds. 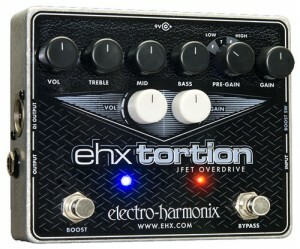 The overdrive/distortion pedal I recommend is Electro-Harmonix’s flagship pedal: the EHX Tortion. The reason I highly recommend this pedal is that it will give you incredible flexibility in dialing up the exact distortion or overdrive you want. That means it’s not a pedal you will outgrow as you will with many other distortion or overdrive pedals. As a guitar teacher, I see it all the time where a beginner buys a pedal then a few months later sells it because they don’t like it anymore. Having a flexible distortion pedal where you can tweak the tone and try out a wide range of different style distortions or overdrive means you’re not likely to grow out of this pedal. It’s hard to recommend a modulation pedal because modulation covers a few different effects. Modulation is also a very personal thing so what one person says is the best will be very different to what another person says is the best. You can easily find people arguing on forums over which chorus pedal is the best because every guitarist has different tastes and preferences. 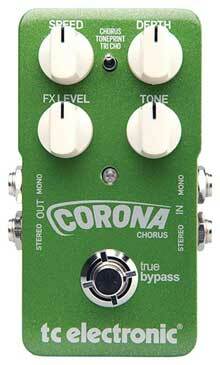 Because every guitarist will have different preferences when it comes to modulation, I recommend the Corona Chorus by TC Electronic. The main reason I recommend it is because of it’s ‘TonePrint’ feature – it allows you to create your own unique chorus effect and save it to the pedal. Being able to select the type of chorus you prefer and create your own custom preset means you won’t outgrow the pedal. While there are plenty of other fantastic chorus pedals, this pedal will give you the flexibility you need as you develop as a guitarist. As your preferences in chorus change over time, you simply edit your TonePrint preset and it’s good to go. Getting a good quality delay pedal should be one of your first purchases. The majority of guitarists use delay because it’s such a flexible and useful effect. You can use it with essentially any tone with any combination of effects and expect great results. The chances are a lot of songs you listen to will use delay. There are quite a few different types of delay and being able to easily switch between different delay types is important. For this reason, I’m not going to recommend a pedal that only gives you one type of delay. It’s frustrating when you buy a delay pedal then realize that you can’t get the right settings for half of the songs you like. So the priority here is flexibility. If you have a flexible delay pedal with a range of different delay options, you’re going to be able to replicate more delay effects you hear in songs. The delay pedal I recommend is the Flashback Delay by TC Electronic (now in version 2). There are two reasons why I recommend this pedal. The first reason is that it gives you access to a wide range of useful delay types. The TonePrint feature allows you to dial in the exact settings you want. This is really important for delay because a lot of songs will require a specific delay setting down to the correct millisecond. 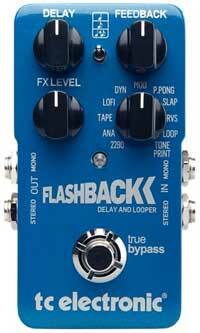 The second reason I recommend the Flashback is because it has a simple built-in looper. While you could buy a separate looper pedal such as the very popular Ditto Looper, having one built into a delay pedal simply means you can get more out of fewer pedals. As a guitar teacher, I highly recommend every beginner have a looper pedal. You can learn how to use a looper pedal in my lesson here. No matter how many individual stompboxes you buy, there’s always some song you want to play that uses an effect you don’t have. Before I bought a multi-effects pedal I was always frustrated whenever I would play a song but didn’t have the proper effect pedals. One song might use a tremolo effect or another song might use a Uni-Vibe and I wasn’t going to clutter my pedalboard with effects that I would only use on rare occasions. If you want to have a wider range of effects available but mainly want to stick to stompboxes, here’s a way you can cheat and have both. Use the above recommendations for your main effect pedals and use a small multi-effects pedal for those random effects that show up from time to time but aren’t important enough to buy a dedicated stompbox for. The way I think about this is that you’re using a pedal as a ‘backup effects library’. Whenever you want to play a song that uses an effect you don’t have with your stompboxes, you can browse through your backup library and find the effect. While it might sound strange to include this in a pedalboard focused on individual stompboxes, as a beginner having access to a broad range of effects will be incredibly handy. 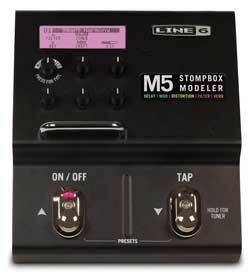 The multi-effects pedal I recommend for this purpose is the M5 Stompbox Modeler by Line 6. It’s a bit bigger than a large stompbox and gives you access to well over 100 different effects. It’s designed to be used as a standard stompbox so it fits in with this pedalboard perfectly. The M5 gives you access to 19 different delays, 23 modulation effects, 17 distortions, 12 compressors and EQs, 26 filters and 12 reverbs. So if you find a song that needs a spring reverb, an envelope filter or some other random effect you’ve never heard of before, the chances are the M5 will have it. When you consider that it costs about the same as some of the stompboxes above, it’s a good way to expand your collection and play around with different effects. You will notice that the M5 contains a lot of the effects covered in the other pedals. For example, it has a stereo chorus, a lot of delays, plenty of distortions and even a tuner. So why would you want the M5 as well as the other pedals? The answer is simple: having the M5 means you can run two delays at once (a very common thing to do), two chorus effects at once or two different distortions at the same time or ready to switch back and forth. Use your main pedals for your effects and use the M5 to supplement your effects when needed. Once you give it a go you will see how powerful this rig is. There’s a few pedals by TC Electronic here and that’s mainly because their pedals focus on flexibility – something that’s really important for beginners. 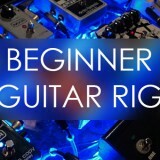 There are plenty of great alternatives to all of the above pedals, but this rig focuses on pedals that will work great for beginners based on my experience as a guitar teacher. This can be a stereo rig! A great benefit with this rig is that all four effects stompboxes (not including the tuner or wah) are stereo. This means if you ever want to make some recordings, you can take advantage of your stereo rig. Or you can even connect a second amp to your rig and experiment with different stereo effects such as stereo delay or chorus. This is something a lot of guitarists miss out on because some of their pedals are mono. If you haven’t played through a stereo rig before with a stereo chorus or delay – you’re missing out! While the wah and tuner are mono, as they will be at the start of your rig it won’t impact your stereo signal. Most pedals come with a power supply which is great if you only have a couple of pedals, but when you have more than a couple the individual power supplies become a pain. A great alternative is to buy a dedicated power supply unit to power your entire pedalboard. There are a few options available but the most popular choice is the Voodoo Lab Pedal Power 2 Plus (link to Amazon for price and details). It’s a well-built unit that will power this entire rig as well as have room for more pedals you might add in the future. Check out my review on the Pedal Power 2 Plus here to find out why it’s worth considering. Connecting a few pedals together can be a mess if you’re using standard instrument cables. Buying a few ‘patch’ cables as they’re called will help keep your pedalboard neat and tidy. Patch cables are usually around 6 inches long so keep this in mind when you arrange your pedalboard. I recommend ChromaCast Pro Series Cables (4-Pack) as they have great reviews. They come in a four pack so make sure you count how many cables you need for your rig. For this rig, you will need 5 patch cables for mono and 8 for stereo. I recommend starting with your rig in mono for simplicity. In total, for a mono rig you will need 5 patch cables and two longer instrument cables (one to connect your guitar to the pedalboard and one to connect the pedalboard to your amp). For a stereo rig, you will need 8 patch cables and three longer instrument cables. If you want to stick to a low budget, just keep your pedals on the floor. But having a pedalboard where you can mount your pedals to makes a big difference. In the next section, I will talk about using a professional pedalboard. If you choose to get one, one useful accessory you will want to get is velcro strips to mount your pedals to your board. The big advantage with velcro is that you can rearrange your pedalboard quickly and easily. 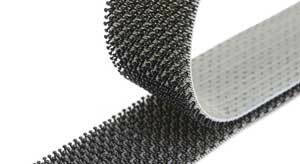 Check out Power-Grip Pedalboard Velcro Alternative Pedal Mounting Tape for a popular option. Simply apply one strip to your pedalboard, then the other strip to the back of your pedal. 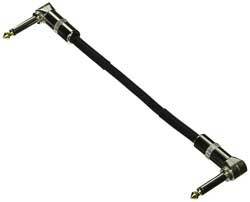 The only time where you won’t need this is if you set your pedals on your floor without a pedalboard. While you can simply lay your pedals out on the floor, if you want a more professional looking pedalboard I recommend getting a pedalboard such as one by Pedaltrain. These pedalboards will allow you to velcro your pedals onto a board which is handy if you ever join a band and need to transport your gear for gigs or practice sessions. The pedalboard that works with this rig is the Pedaltrain Metro 24 (or anything larger). This size pedalboard will easily fit all pedals with room for a couple more smaller pedals in the future. If you think that you will buy adding a lot of pedals to your pedalboard over time, you might want to buy a larger pedalboard such as the Pedaltrain Classic 2 (comes with softcase). It might feel strange to have a big pedalboard with heaps of space, but as you start collecting pedals space quickly become more and more valuable! So if you feel like you will be buying more pedals over time, I recommend getting the Pedaltrain Classic 2. Otherwise, the Metro 24 will be enough for this rig. You can either place the wah pedal on the pedalboard or place it on the floor next to the pedalboard. Some guitarists prefer expression pedals such as a wah or volume pedal to be on the flat floor instead of a pedalboard. Play around and see what works for you. You can see that the wah pedal is longer than the width of the pedalboard which is why I suggest experimenting to get a feel for whether you prefer it on the Pedaltrain or if you prefer it on the floor. The PolyTune 2 Mini easily fits on the pedalboard when rotated. Hopefully it’s clear why I recommended this tuner – it takes up very minimal space on your pedalboard and allows more room for other more important pedals. The basic idea behind this layout is that you want the footswitches for your most used effects easily accessible and any other pedals you can sit higher up on the board or rotated. So rotating the tuner isn’t a big deal. In 2014, Steve Vai gave an hour-long webinar titled ‘Perfect Pedal Order’ (you can watch it on YouTube here). While it contains a lot of great information and advice for beginners, the video can be summed up in one short sentence: there is no perfect pedal order. While there are general rules guitarists tend to follow when it comes to the order of your pedals, breaking those rules can lead to interesting effects and inspiration. In this guide, I will suggest a pedal order for this rig, but you should experiment with switching the order of pedals so you can hear how it changes your tone. You might find that breaking the rules produces a better tone. In my Guitar Effects Course, I walk you through every type of effect and how changing the position of the pedal can change the tone. If you’re serious about building a pedalboard with multiple effects pedals, it’s worth learning how each type of effects works and how they all interact. In the course, you’ll learn how to set up the right rig for you. As a simple example, most guitarists place the wah before any distortion pedal. The idea is that the wah should receive a dry signal from your guitar. But placing the wah behind a distortion pedal can produce some dramatic and creative results. Some people will love it and some will hate it. The point is that you will only find out what you prefer by experimenting. I highly recommend starting with the order I suggest, then experiment and choose the order you prefer. There is no perfect pedal order. Each > symbol indicates a connection between your pedals. If you want to run your pedalboard in stereo, you will need two patch cables between each stereo pedal as well as to your amps. The yellow arrows indicate mono connections (one cable) and the orange arrows indicate optional stereo connections (two cables). Remember if you don’t have two amps or want to keep things simple, stick to running your rig in mono. As this rig is intended for beginners, I have suggested the simplest wiring possible. But it’s worth noting that there are other ways you can connect your pedalboard together. One option is to use something called the ‘four cable method’. This can only be used if your amp has an ‘effects loop’. It involves basically splitting up your pedalboard. Some pedals will connect to the front of your amp while other pedals will connect to your amp’s effects loop. Using the 4 cable method is messier and a bit more complicated than the above setup. The advantage to using the 4 cable method is that it can produce a better quality tone. I recommend using the setup described above if you’re a beginner. It will still sound great and will be far easier to set up and use. If you’re interested in using the four cable method, read my guide on it here. Get used to the layout and learn how to tell which pedals are active at any time based on the LEDs you see lit up. This might sound basic, but it’s a good idea to instantly know which pedals are active without having to play something. For example if you don’t know that the tuner is active, you’ll be scratching your head wondering why there’s no sound. The M5 uses different colors to indicate different effects. Memorize what the colors are so you know what type of effect you have selected at any time. Practice tuning your guitar using the PolyTune. Strum all of your strings and get used to the display showing you which strings are out of tune. Focus on one pedal at a time and learn how to use it. Play around with each individual pedal and adjust the control knobs to learn how it impacts your tone. Look up songs that use each effect and try to replicate what you hear as closely as possible. This will help tune your ears to different effects. Start combining more than one pedal at a time. Start with something basic such as distortion and delay or wah and chorus. Experiment with two pedal combinations. Go all out and activate all pedals. Experiment and come up with as many different crazy sounds as you can. Learn what works and what doesn’t. Go through all the effects on the M5 to learn what you have accessible in your backup library. Start combining those effects with your other pedals. If you follow the above steps, you will quickly become a pro at controlling your rig. The beginners who actually follow these steps end up with better results because they learn how to tweak and refine their effects. It’s worth spending the time to learn how to do that. If you follow my advice, you will end up with a very powerful and flexible rig. Of course, every guitarist has different needs and you might find that over time your rig will change. This rig isn’t perfect because there’s no such thing as a perfect rig. The right rig for you will be different to everybody else. This rig will give you a great starting point and you should feel free to customize it as you like. Feel free to read through my reviews of other pedals and substitute any pedals in and out of this rig as you want. You could have a total of three pedals in your rig or you could have over ten. If you do create a rig, I’d love to see what you create. Send me a message here and include a photo (using a photo sharing website such as tinypic.com or imgur.com). If you’re serious about guitar effects and want to learn more, the Guitar Effects Course is the best learning resource I’ve created on the topic. Check it out to find out how to get the most out of every single pedal you buy. I’ll be adding more lessons over time so join my mailing list for new lessons and guides. If you’re looking for more recommendations for your pedalboard, check out the Essential Guitar Pedals Recommended by Top Guitar Bloggers. There are some great pedals in those recommendations so if you want to take your pedalboard further, it’s a great place to start. 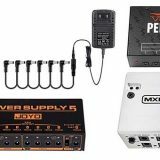 This guide explains in depth how to set up a versatile guitar pedalboard designed for beginners. Find out what guitar pedals are recommended for beginners and create a pedalboard you won't grow out of.